If you want to get really technical, I bought this back in May. It only just now finally arrived. 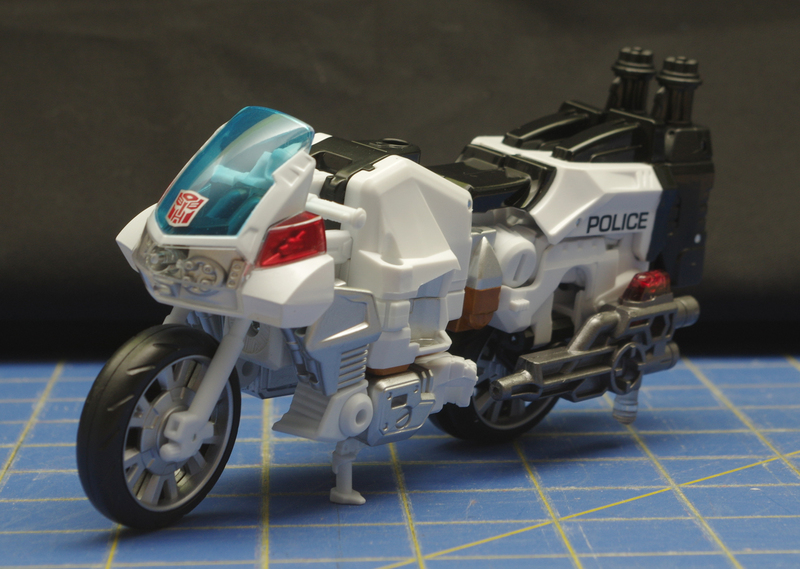 The short story behind Groove, Hasbro decided having a motorcycle as part of the Protectobots was kind of absurd, since he would be crazy out of scale, so they replace him with a new character, Rook, and gave us a Legends sized Groove. Takara, over in Japan, decided they wanted everything to be “really G1” and made their own Groove. There were rumors about Groove not passing some sort of drop test, and this that being the reason he couldn’t be released in the US. 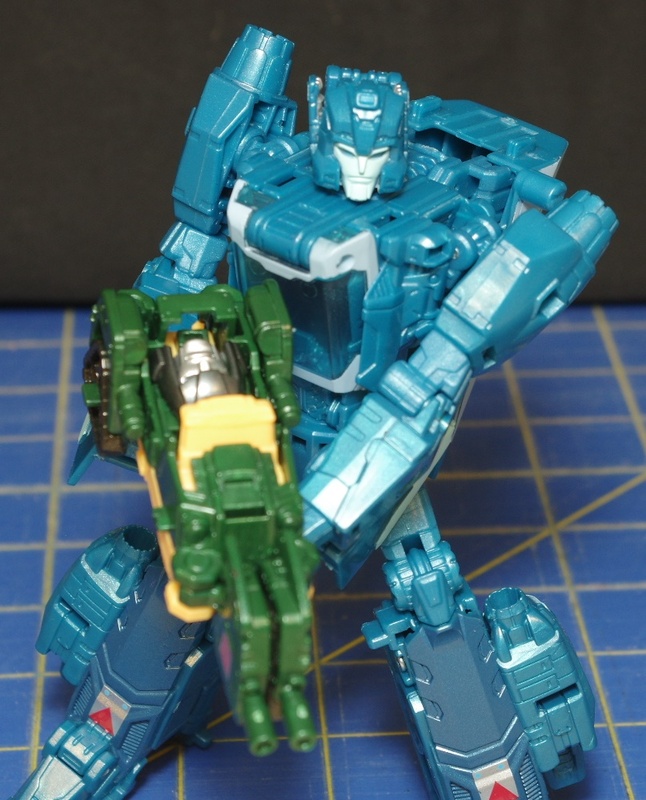 Then there were rumors that he was too complex/large to fit the budget for a Deluxe toy (I find this more likely). Whatever the reason Groove wasn’t initially released, he ended up getting his own special release. This isn’t unprecidented, the year before the two missing members of the Aerialbots and Stunticons also got their own release. I’m kind of hoping the Shuttle Blast Off gets one next year, mostly because it would mean I have 4 extra limbs from the “new characters” to use on Sky Lynx. Groove Himself is… mostly alright, and really out of scale with everyone else. I pretty much keep my Combiners combined though so I’m good with using Groove as a leg and recovering Rook to keep as a separate figure. Rook is pretty great, but he’s kind of a boring limb. 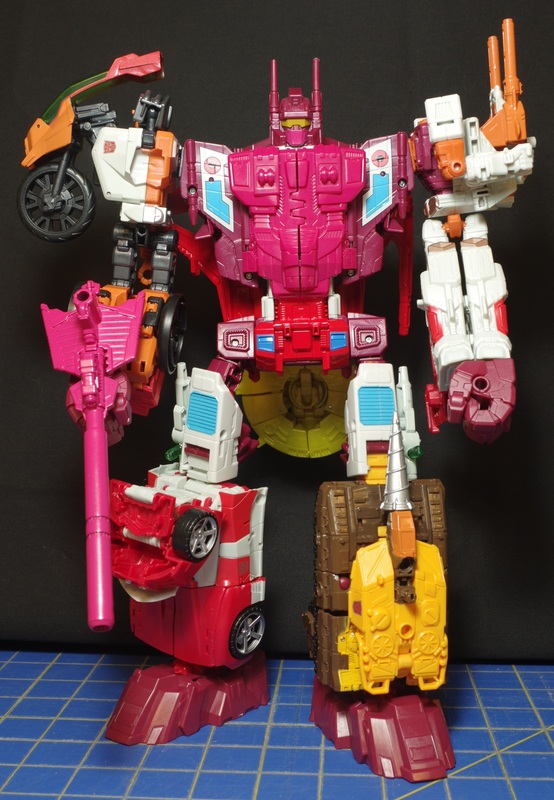 I guess what I’m saying is, for those who missed out on Groove, you aren’t missing out on much, and he’s probably not worth the excessive secondary market mark up. In other Transformers gets, I was really surprised to find Bisk hanging on the pegs. I’ve heard a lot of chatter about Bisk from people who watch the show and his designed seemed really neat. 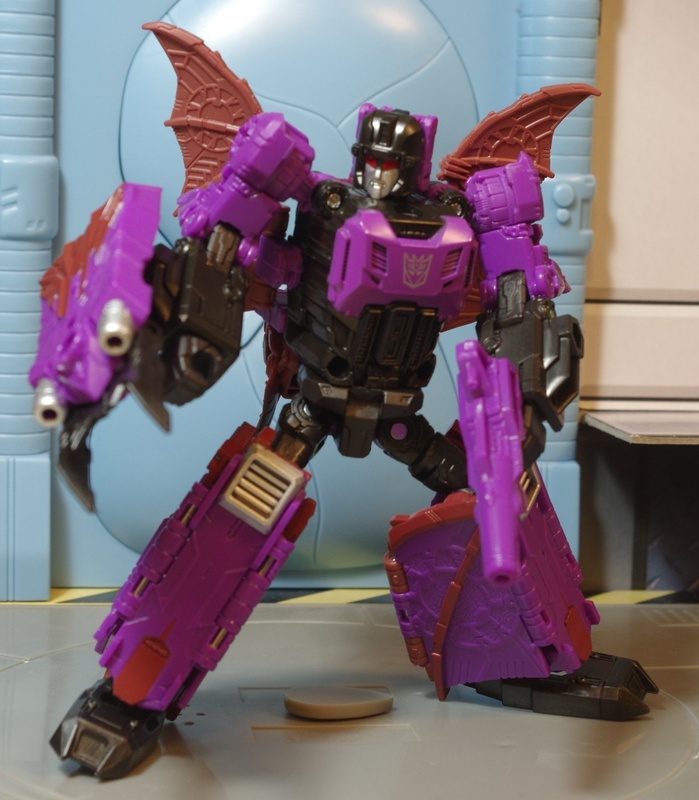 He’s a big goofy Lobster robot that turns into, well, a Vehicon. Mostly a Vehicon. 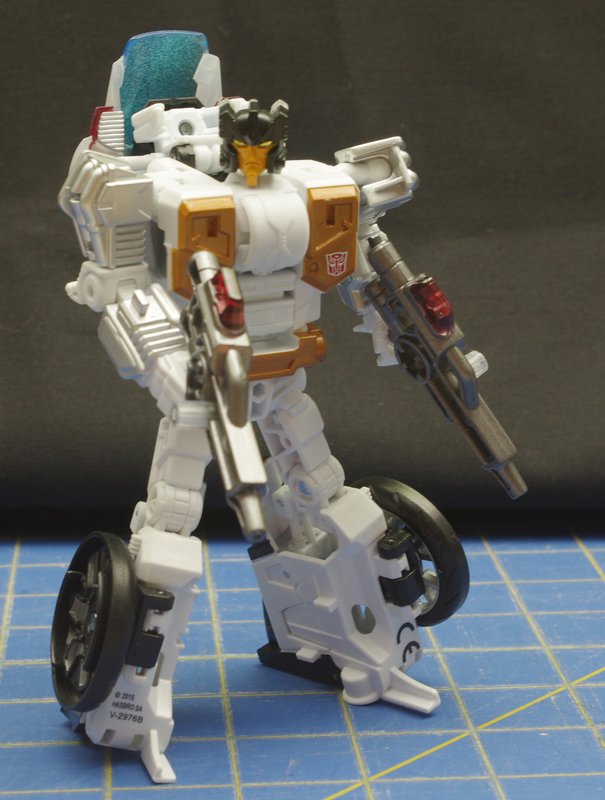 I don’t watch the show so I don’t know if there is something to it but his vehicle definitely resembles the Vehicon cars from Transformers Prime and his gun mounts help seal this deal. 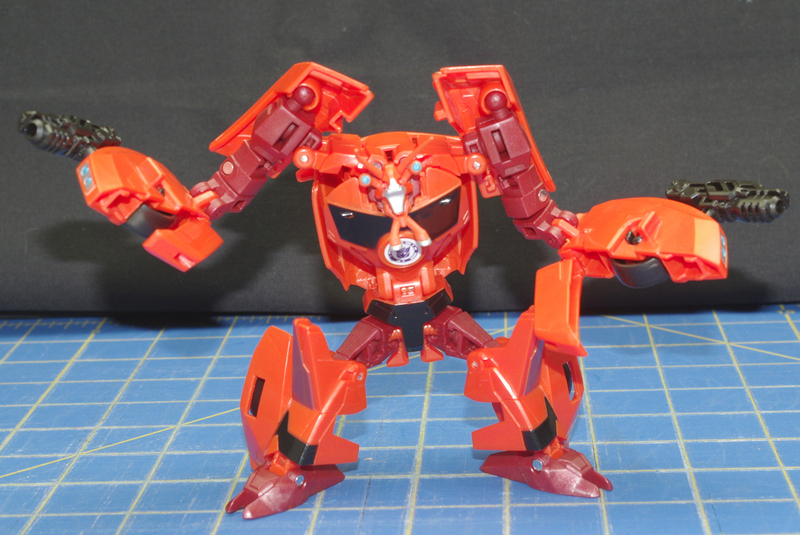 His Lobster-man robot mode is definitely not a Vehicon though. He’s definitely, a giant Lobster-man. It’s definitely a neat and fun design. The way his arms are jointed to flip around on themselves during transformation really adds a lot of poseability and options to the arms in Robot mode. His backpack even works in his favor since it comes off looking like a Lobster shell. 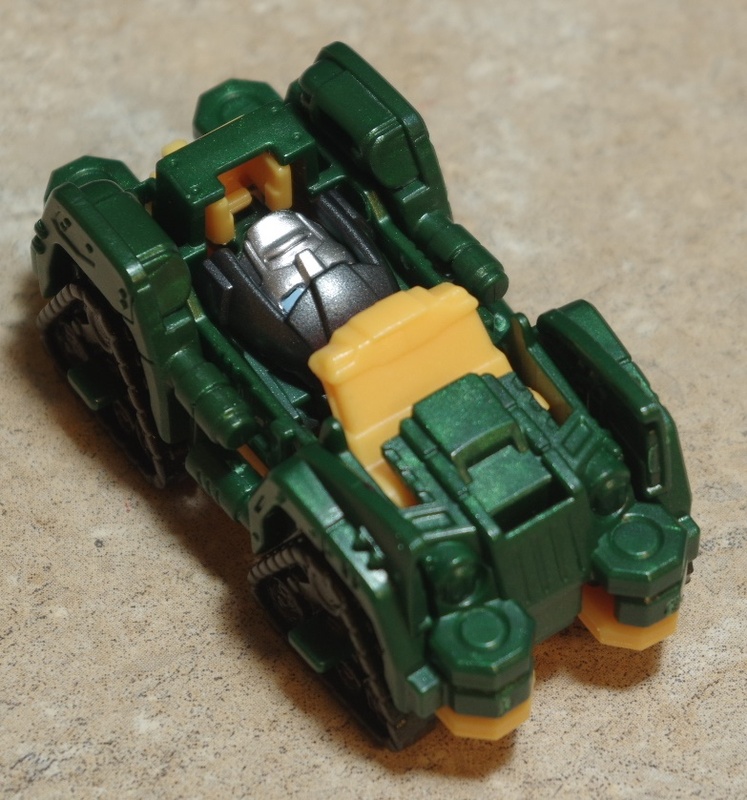 I’m not sure if there is much else coming down the pipe for Robots in Disguise, maybe a few repaints, but if this is the last of the Decepticons we get, I’ll remain pretty satisfied. It’s kind of a bummer that the Autobots of the earlier waves were just kind fo lack luster and unoriginal with their character options. I can see how fans of a more traditional robot design in their Transformers wouldn’t like a lot of these Decepticon designs but I really like them a lot. They are essentially all new characters, and all have this nice little theme going on that makes them feel like a team. Honestly, they are starting to feel like some sort of rejected line up for a Mega Man X title. So, along with Bisk, I was surprised to find the Doctor Strange wave of Marvel Legends. I kind of worry this is going to be like the Ant-Man wave was, only possibly worse. 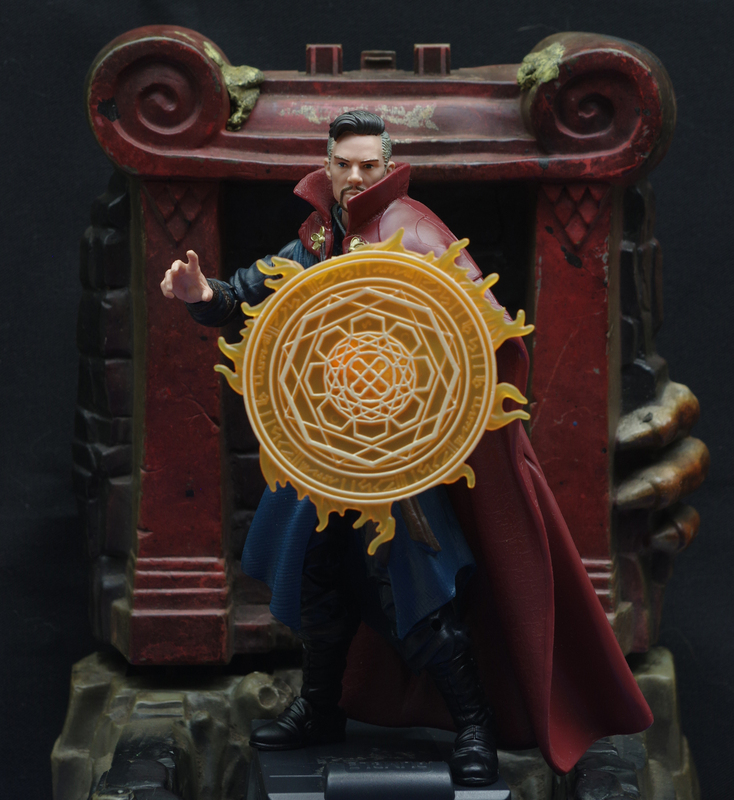 Half the figures were recently released in slightly different versions in a boxed set, that a lot of Doctor Strange Fans probably already picked up. The other half of the figures are Doctor Stranges, one being the same as the Hulkbuster Strange + a cape, the other being a kind of lame “Invisible” Strange. The third being the movie version Cumberbatch Strange. This is the Doctor Strange I picked up, and it’s likely to be the primary draw for a lot of people in this wave. The only other figure I want to pick up is the kooky Gothy Magic Girl, whatever her name is, mostly because the design is “neat” and she will be find for kooky photos. This Doctor Strange is great. I really like the MCU figures, they all seem to be pretty top notch and I prefer the realistic style over the comic looks for most of the the characters anyway. He also comes with a different magic effect part! Tons of figures have been getting the newish arm clip swirly thingies that I believe originally came with Scarlett Witch. Several figures from this wave use them, the previous Hulkbuster Strange had them, they are starting to feel a little overused. This movie Doctor Strange instead has a sort of shield glyph thing. The fact that it holds like a shield is a little funky but you can’t really see the handle when he’s holding it due to it’s size. It’s a nice change. He also has extra hands, one set is kind of closed for holding things (like the shield magic part), the others are a slightly open and relaxed design. On a side note, I’m kind of relieved to say my want list for Marvel Legends is finally dying down for the year. There’s not really any waves left that aren’t starting to trickle into stores. I don’t really want anyone from the Space Knight Venom wave, though I may look into Hob Goblin. Spider-man waves with their endless Spider People and Symbiotes get really old, especially when Spider-man has so many interesting villains. There’s the Abomination Wave, which has the MCU Scarlett Witch, a figure likely to be impossible to find. I have a couple more X-men to pick up still and I really want that TRU Kate Bishop Hawk-eye, though I don’t want to pay the 3 pack price for it. There’s been almost too many waves this year, they really could have cut an entire wave by maybe not putting a Captain America in almost every wave or something. Lastly, I did some sort of “Force Friday” shopping, (the next day), and bought K-2SO. The figures from Rogue One all look interesting and I’m pretty stoked for the movie but I kind of want to hold off on picking any of them up until the movie actually comes out. Also there is a 3 pack with Jyn Erso that seems like a better idea than the solo figure, since it has another Rogue Squad guy and a Trooper. I also really dig that unmasked Kylo Ren, but I hate the idea of buying the same figure again just for the new head. I may look into doing some sort of import version to fill that desire instead. 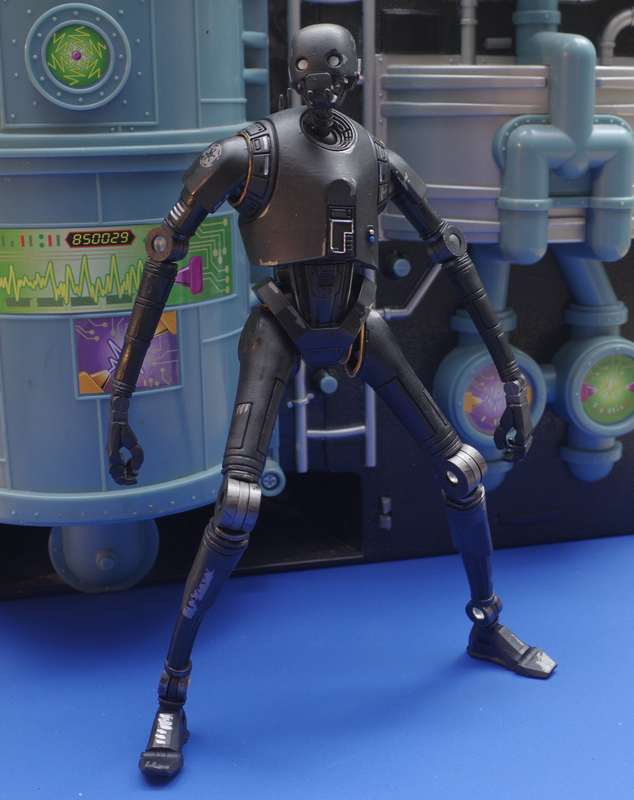 K-2SO is pretty cool, he has a lot of interesting design cues from other Star Wars elements. His back sort of resembles C3P0’s or a Storm Trooper. I’m sure the head has shown up on some other similar droids (if not the same model). The overall design kind of reminds me of a Super Battle Droid from the Prequel trilogy.His long spindly legs make him a little tricky to stand up and balance. I also have no idea of what his real role is, He cane be posed pretty dynamically, but for all we know, in the movie, he could be as mobile as C-3PO.